When I think about the environment and all of the damaging effects that humans have had on our world, it feels pretty overwhelming. Visions of plastics swirling through the ocean spin through my mind. It seems impossible to overcome. 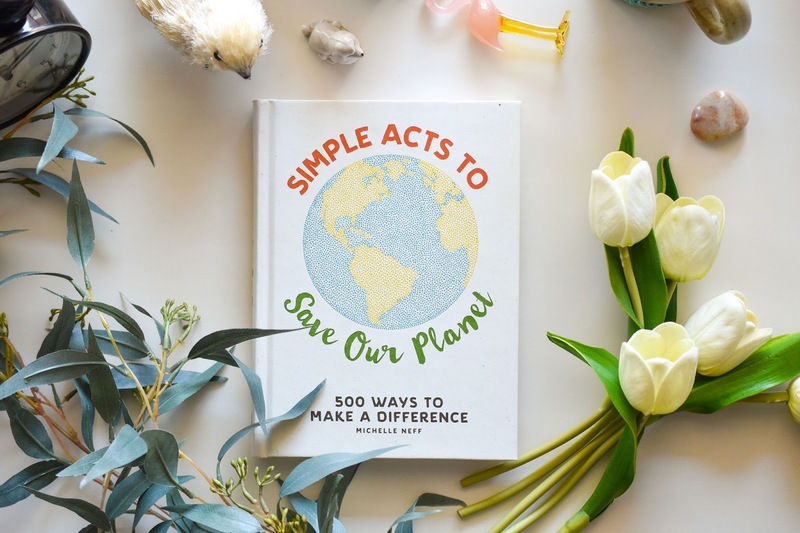 But, with Earth Day coming up on April 22nd, it's a fitting time to take a deep breath and think about the simple steps that we ordinary people can take to make things better. 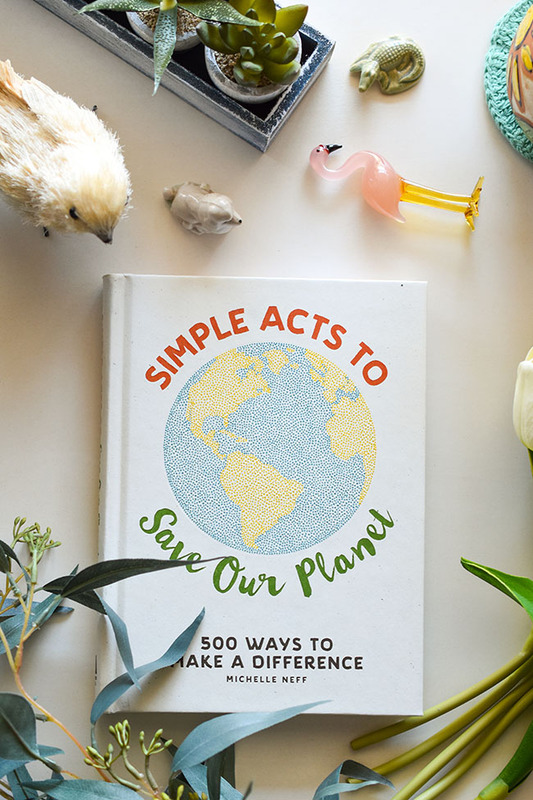 Just released today, One Green Planet writer Michelle Neff's new book Simple Acts to Save Our Planet: 500 Ways to Make a Difference outlines easy ways for us to perform simple acts of kindness for our earth, with manageable activities that range from simple home updates, to gardening basics, to supporting the local community. The book's publishers, Adams Media (a division of Simon & Schuster), were kind enough to share some excerpts so that we can all get started today. But first I want to share some ideas for celebrating Earth Day as a family. Earth Day falls on a Sunday (in spring!) so it's a perfect opportunity to get out and about with your family and/or friends. Earth Day Canada shares this very simple yet incredibly powerful idea for Earth Day: Consume Less, Play More. I can't think of a better approach to marking Earth Day. It really could be a mantra for every day, couldn't it? I think it applies to adults just as well as children. Care less about what we buy, what we own, what we have and care more about what we do, how we spend our lives, where we spend our time and who we spend it with. As Earth Day Canada notes on their website, "Plastic pollution and its threat to nature and human health is a pressing concern. Reducing consumption is a moral imperative and will make you happy! Buying things and acquiring wealth does not make us happy. Rather, connecting to others and our natural environment is the key to happiness—the mindset of sustainability. For kids and adults, free play is our truest form of connection and happiness." With this in mind, celebrating Earth Day could not be simpler - eschew the mall, TV or gaming system in favour of getting outside. If you have young children, head to your local park or trail system. Have the kids help you to prepare a meal that is heavy on veggies. Older kids can join you on a woods walk or hang out with their friends playing outdoor basketball. They can help you map out your garden or choose plants and perennials. If you have the space, plant a small tree. Skip rocks in a pond or lake. Buy nothing. Walk the dog. Gather up stones to paint later. Turn your painted rocks into picture magnets. To end the day, snuggle into bed with a couple of books about nature, plant life and animals. We know that our children aren't spending as much time outdoors as we did as kids. They aren't wandering and exploring. They are spending too much time on devices and not enough time walking in nature. Let's be honest, the same goes for many of us adults. Bonding with nature decreases stress levels, increases physical activity, helps you to bond as a family and builds respect for nature. Humans have a unique ability to alter our natural environment, and by making simple changes to the things you do every day, you can protect the planet now and make a real difference for the future. What’s more, your commitment to sustainability may inspire others to take action as well! Remember, little acts really do add up to big change. Buy in bulk. Not only will buying items such as spices, beans, grains, dried fruits, and canned vegetables in bulk help cut down on the amount of waste produced, but you’ll also save money and will eat healthier. Also, bulk items usually aren’t loaded with preservatives to keep them fresh. Skip red meat once a week. Meat production is placing a massive strain on the environment since it requires approximately 1,800 gallons of water to produce just 1 pound of meat. That’s a whole lot of water! Knowing how resource intensive the animal agriculture industry is, you can make a huge difference by opting for a yummy veggie burger one night (or hey, maybe even multiple nights!) a week. Compost. Not only is compost an awesome (and free!) fertilizer that nourishes plants and enriches soil, but it also reduces the amount of waste going to landfills. You can start a compost pile in a corner of your yard or opt for a compost container. Then all you have to do is collect items to compost, such as fruits, vegetables, and coffee grounds! Donate seeds to a community garden project. Community gardens are designated areas where people plant and maintain vegetables, fruits, herbs, and flowers. Community gardens are essential for bringing fresh, healthy fruits and vegetables to food deserts and other areas that otherwise wouldn’t have access to whole foods. Donate seeds (or volunteer your time!) to these crucial initiatives. Return containers for fruits and vegetables to the farmers’ market. If you buy items like berries or tomatoes in little plastic containers when you go to the farmers’ market, remember to return the containers the next time you go. This way, they will be reused and not end up as trash. Or better yet, bring your own containers! Can your own foods. Maybe you have too many tomatoes from this year’s harvest and don’t know what to do with them all. Preserve this year’s crop by canning! Canning is a process in which you place fresh fruits and vegetables in jars and then heat the jars to a certain temperature to destroy microorganisms that can cause food to spoil. Canned foods also make great gifts, and you’ll be cutting back on packaging waste! industry is one of the largest drivers of deforestation and is responsible for more greenhouse gas emissions than the entire transportation sector. Simply swapping foods you love with plant-based alternatives is a great way to cut your carbon footprint in half! Use aluminum cans instead of steel. Aluminum is one of the easiest metals for consumers to recycle. Generally, cans (such as soup cans and canned fruits and vegetables) are marked as aluminum, and steel is usually heavier. Ferment foods. Not only will fermenting your food to make sauerkraut, kimchi, kombucha, miso, and other items help preserve the food, but fermented foods have long been touted for their health benefits. Fermenting vegetables will increase their nutritional value, benefit your digestive tract, and promote good oral and dental health. And no food goes to waste! Make your own vegetable broth. Save your cooking leftovers and make a broth out of the vegetable scraps by sautéing the scraps and then simmering them with water, herbs, and spices! Start a seed exchange. Save seeds from organic fruits and vegetables bought at the farmers’market and create your own seed exchange among fellow gardeners (a fun hobby to pick up). You’ll save money since you won’t have to buy seeds, and you’ll help maintain organic foods that aren’t made using GMOs. Dry your foods. Many food items, such as fruits, vegetables, and herbs, can be dried, meaning the water is removed from the food as a way to preserve it. Drying your own food is a great way to take a stand against industrial agriculture by sourcing and preparing your own food right at home! Pickle your vegetables. The process of pickling vegetables has been around for thousands of years and is used by many cultures. Learn how to preserve your crops by pickling them and you won’t have to buy prepackaged vegetables at the store! When shopping, look for products with minimal to zero packaging, like fresh fruits and vegetables. Since many types of junk food come in heavy packaging, you’ll more than likely eat healthier too! Excerpted from Simple Acts to Save Our Planet: 500 Ways to Make a Difference by Michelle Neff Copyright © 2018 Adams Media, a division of Simon and Schuster. Used by permission of the publisher. All rights reserved. Does your family get outside very often? Do you have plans to celebrate Earth Day? Do any of these tips resonate with you? Do you have any more tips to offer?